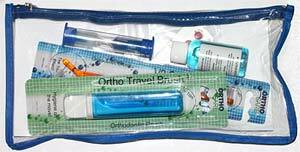 These items are complimentary and you will be given detailed instructions of how to clean your teeth and brace. 1. How do I clean my brace and teeth? Clean one tooth at a time using a circular motion with a soft small headed manual toothbrush (available in the practice) whilst watching in the mirror hold the cheeks back in order to see what you are doing. Use disclosing tablets and a fluoride mouthwash regularly as instructed. 2. What should I eat? All foods must be soft and chopped up into tiny pieces. DO NOT EAT HARD FOODS e.g baguettes, paninis, carrots, apples, crisps,biscuits, crusts etc. DO NOT EAT STICKY foods e.g. chewing gums, toffees ETC ETC. 3. What should I drink? You MUST NOT DRINK FIZZY DRINKS e.g Coke, Fanta, diet versions etc. Drink ONLY water, milk, tea, coffee with NO SUGAR. 4. What should I do if the Brace becomes uncomfortable? Some discomfort is to be expected for 3-4 days after which it will subside. Adults may get tenderness for slightly longer. Apply the soft wax provided on any sharp edge of your brace where it may be digging in. If pain persists for more than a week or if you are worried please call Glasnevin Orthodontics (8340577). 5. What should I do if the Brace breaks? NOTE: A MOUTHGUARD should still be worn for contact sports – the old Mouthguard will not fit anymore so dispose of it. – We can provide you with a special Orthodontic Mouthguard specific for sportspersons with a brace in place. ALWAYS REMEMBER: IT IS IMPORTANT TO KEEP ATTENDING YOUR OWN DENTIST FOR REGULAR CHECK UPS DURING ORTHODONTIC TREATMENT.